Inspired by playing The Legend of Zelda video game series, Cornell University students [Mohamed Abdellatif] and [Michael Ross] created a Virtual Archery game as their ECE 4760 Final Project. The game consists of a bow equipped with virtual arrows and a target placed about 20 ft away. The player has three rounds to get as high of a score as possible. A small display monitor shows the instructions, and an image of where the shot actually hit on the target. Pressing a button on the front of the bow readies a virtual arrow. 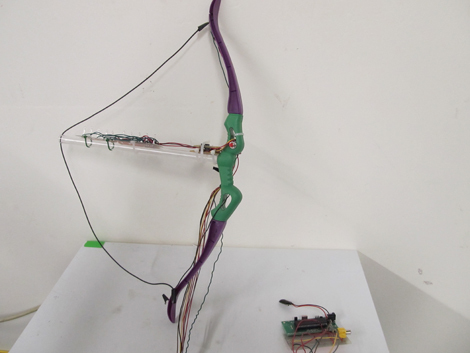 A stretch sensor communicates with a microcontroller to determine when the bow string has been drawn and released. When the bow is drawn, a line of LEDs lights up to simulate a notched arrow. The player aims, and factors in for gravity. An accelerometer calculates the orientation of the bow when fired. The calculated shot is then shown on the display monitor along with your score. This immediately makes me think of Laser Tag, and feels like a product that could easily be mass marketed. I’m surprised it hasn’t been already. Good work guys. Are you bored with just drinking beer? Are your friends constantly sneaking into your house and stealing your sacred beverages? If so, perhaps you need KegDroid – the Android controlled beer tap created by [Paul Carff]. Looking for a way to add more excitement to drinking his beer, [Paul] spiced up his tap with a little extra technology. He added an Android tablet for touchscreen navigation of the menus, an Arduino to control the flow sensors and solenoid valves, and an NFC reader to act as security for restricted access. Users must be authenticated before they are allowed to pour any alcohol. Your name and photo are pulled from your Google+ account as you’re logged in, then you simply select your beverage of choice, and if you’d like a one, eight, or twelve ounce pour. Flow sensors automatically shut off when you have the desired quantity. Seems like you get more foam than beer, but all in all it’s a cool bar top app. When we think of defense against lion attacks, the first thought is usually guns. Lots and lots of guns. [Richard Turere], a 13 year old Kenyan tinkerer with neither books nor any technical education, has come up with something entirely different – He’s keeping the lions at bay with a solar powered system of flashing LEDs. Yup. Flashing LEDs. Since he and his family live next to Nairobi National Park, lion attacks are an ever present danger. The only defense systems available were far too expensive for his family to afford, so he decided to build his own. He utilized the basic resources he had readily available: LED bulbs removed from broken flashlights, some switches, an old car battery, wire, and a solar panel that also operates his family’s TV. The results speak for themselves. His family has had no lion attacks in over two years, and at least five of his neighbors believe in the system enough to have had him install it on their fences too. With the cost for this set up at less than ten dollars, and all the parts being readily available, this rather basic electrical system is an amazing breakthrough for the Kenyan pastoralists. We look forward to seeing more of [Richard’s] inventions. Way to go!